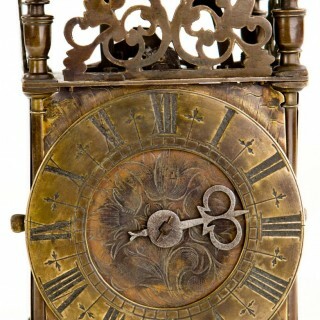 This is a most unusual clock, it has never had a backplate or bellstrap fitted, it has a brass top plate and an iron bottom one. 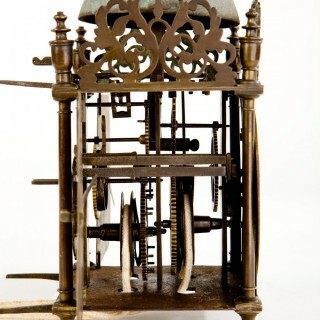 The posted frame case has side doors hook & spikes and an anchor escapement movement, which strikes the hours on a bell via an outside countwheel. The duration is approx.20 hours at 72” high or 24 hours at 76” high. 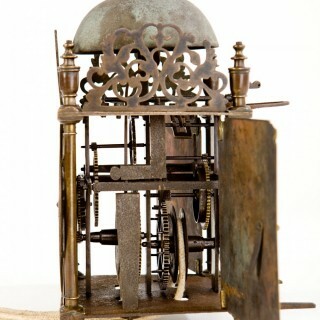 The bell is fitted like a longcase with an iron stand screwed into the top plate. The chapter ring is 5 ¾” with meeting arrow ½ hour marks inside ¼`s and the dial has engraved corners and floral engraved centre. It retains its quite exceptional original hand. 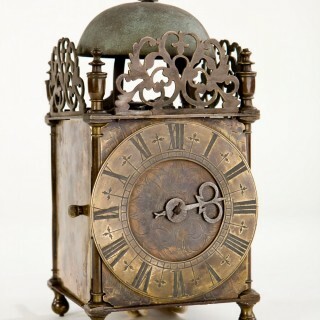 A most rare and original late 17th century lantern clock, probably North West England C1690.